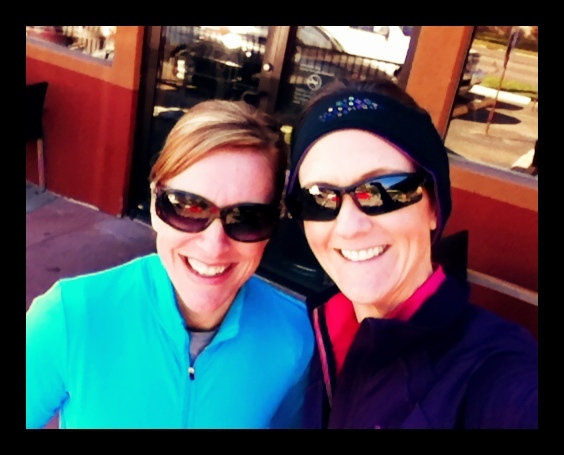 My friend and I just following our 5K “fun run”… Clearly we’re crazy to run in these cold temps! My energy has been increasingly failing, and my body just hasn’t had the strength it once did. I have continued to work out about 4-5 days a week, just at a slower pace, and impact. When my friends and I started talking about the local university’s homecoming 5K race, we realized it fell on a day that wouldn’t work for us with some other commitments. Another race was suggested, and we went for that instead. As I had blood tests for my thyroid and a sonogram on my neck… I thought surely I’d have an answer to feel better by now… but no. I hadn’t had the energy to run much… so for the past 2 months, I didn’t. As the time got closer for the race was approaching… I, sadly, didn’t want to run. My faithful friend kept encouraging me to get signed up… and I didn’t want to let her down. I signed up… still hoping for the sky to fall before the race. The week of the race, I got a 5K in on the treadmill – just to make sure I could still do it… and I could…so I was thankful. It was ugly, but I could do it. Then I foolishly did 100 thrusters a few days later, which prevented me from walking right for the rest of the week, let alone fitting in another run. On the day of the event, the temperature was about 30 degrees, so you can imagine MY excitement to be out in it running. I didn’t break any records, and it was my second time running outside – my first time was last year’s 5K… 🙂 So obviously, I’m not a REAL runner. I did it because I had commitment to my friend that I would…. and I knew my body was able to make it… and furthermore ACTING sick isn’t helpful to me being well. I’m a mind over matter person – and while I know that doesn’t always work with auto immune disease (yes, it’s frustrating!) to continue to move and be positive is essential. I’ve seen cancer patients run races between their chemo treatments, I’ve seen people with disabilities doing what THEY can to run and move their body… I really didn’t HAVE an excuse, and I knew that. You see, it’s NOT about winning… or breaking records… running isn’t that for me, and neither is working out. It’s about moving the body God gave me… and doing what I can, while I can. Someday I might not be able to move my legs – and I will be grateful that I ran in that….. FUN RUN. When I sprinted my last bit of energy across the line (after walking quite a bit of the race!) – I cross the line strong at 30.12, slower than the year before. But I was alive, and able – and I was happy I kept my word to my friend. Did I mention we got our workout in for the day? Yeah. That felt pretty good too. I will say, I put TOO many layers on, and the verse below came to mind several times as I ran… I wish I could take off this coat!! 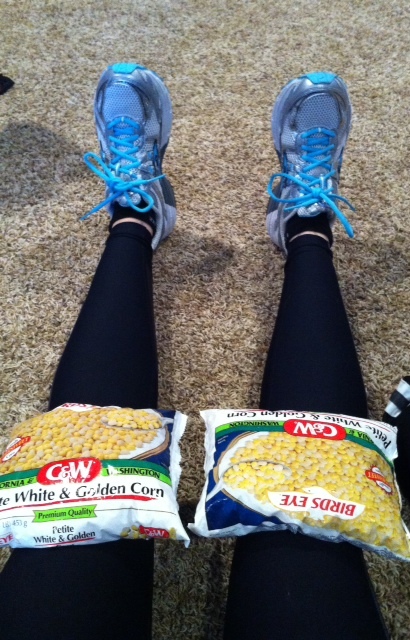 One thing my old corn bags are good for – was for after the race. My knees were pretty swollen for a few days… clearly I wasn’t in the best shape for running… but no major injuries were had, I just still can’t run! fixing our eyes on Jesus, the Pioneer and Perfector of faith. Posted on October 17, 2012, in Celiac/Gluten Sensitivity, Metabolism, Our Struggles and tagged exercising with auto immune disease, healthy for him, Running with celiac. Bookmark the permalink. 7 Comments. Have you considered that the intensity of your work outs might be hindering the healing process? What a great question! Actually, I feel best when I’m able to work out. I’m sure that’s part of the auto immune disease – and the fact that it relieves stress, keeps my body strong, and helps my digestive process. I would say my workouts are about half the intensity – as a year ago, if that. Now I focus more on trying to get a workout in vs. how long my workouts are. I do feel best though, when I’ve been working out consistantly. I’m sure everyone is different. WORKOUTS 4 to 5 days a week! You’re body needs to stay strong so it’s at it’s best to fight the autoimmune stuff you’ve got going on. Keep it up! Way to be healthy for HIM! Love ya! Thank you Steph! 🙂 I feel the same way about you! You encouraged me to do my very first fun run! I appreciate your love and encouragement always. Thanks Chrissy! Yes, that’s exactly it for me. If I sit around, I just don’t feel as well! Thankful to Him, I have a body that moves!